Flipbac Seems Like A Cheap Solution For Cameras Lacking A Flip-Out Display | OhGizmo! My one concern before I upgraded to a digital SLR a few years ago was how I would adjust to not having a flip-out LCD display, which made taking low angle shots, or shooting over the heads in a crowd, quite easy. Thankfully the pros of my DSLR far outweighed that con, but I have to admit there are still plenty of times when I have to take a ‘blind’ shot since I’m unable to look through the camera’s viewfinder. Well the Flipbac looks to be a pretty easy way to add the functionality of a flip-out LCD display to a P&S camera, or even a newer DSLR with live-preview, that doesn’t already have that feature. It’s basically a large adjustable mirror that’s designed to be easily attached to cameras with a 3-inch LCD screen. The Flipbac can be angled 180 degrees which should facilitate any low-angle or overhead shots you’re trying to take, and it can be reconfigured for either landscape or portrait positions. 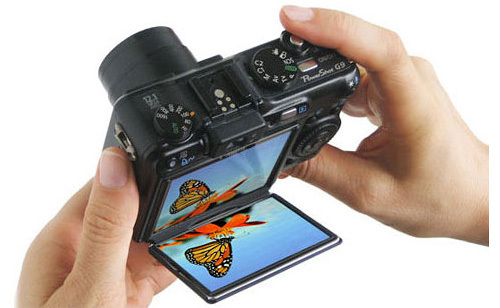 And when not in use, the Flipbac also serves as a durable LCD screen protector when folded flush against the camera. It’s available in either a black or silver finish on the Flipbac Innovations website for just $19.99, and apparently a version for cameras with a 2.5-inch display is also in development.